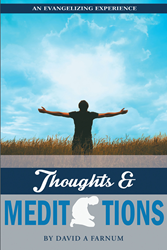 “An Evangelizing Experience: Thoughts and Meditations” from Christian Faith Publishing author David A. Farnum is a rich anthology of poetry exploring the spiritual aspects of our shared human existence. “An Evangelizing Experience: Thoughts and Meditations”: a compilation of poems inspired by Scripture and informed by human experience infused with the charm of the author’s Caribbean origins. “An Evangelizing Experience: Thoughts and Meditations” is the creation of published author David A. Farnum, a native of Barbados who completed his education in England before emigrating to the United States with his wife, Hazel, and his first of four children. Published by Christian Faith Publishing, David A. Farnum‘s new book is a richly seasoned celebration of biblical teaching. View a synopsis of “An Evangelizing Experience: Thoughts and Meditations” on YouTube. Readers can purchase“An Evangelizing Experience: Thoughts and Meditations” at traditional brick and mortar bookstores, or online at Amazon.com, Apple iTunes store, Kobo or Barnes and Noble. For additional information or inquiries about “An Evangelizing Experience: Thoughts and Meditations”, contact the Christian Faith Publishing media department at 866-554-0919.